Bukavu, South Kivu — The commanders of the Kimia II offensive here in South Kivu are quick to provide detailed figures on the number of rebels from the Democratic Forces for the Liberation of Rwanda, or FDLR, they have killed or caused to surrender to back up their positive assessment of the military operation. But these numbers provide little comfort to communities paying the price for the poorly organized operations. In addition to the horrific direct effects of reprisal attacks by the FDLR, whose leadership helped orchestrate the Rwandan genocide, and Congolese army predation, a rising tide of indirect insecurity is contributing to an atmosphere of terror. There are now two major sources of insecurity in South Kivu: reprisal attacks by the FDLR seeking to punish civilian populations for ‘supporting’ the government offensive, and a wider climate of abuses and atrocities committed by the Congolese army, local militias with shifting loyalties, and other bandits and armed groups. The pattern of FDLR reprisal attacks is clear: following Kimia II operations, FDLR forces return to the same villages where they had previously co-mingled with Congolese civilians where they loot, pillage, burn, and kill. Although there is increasing discussion of the measures that would allow the government to consolidate control over these territories, the lack of planning by the Congolese government and UN peacekeepers about means of protecting civilians is inexcusable. In my conversations with Congolese army officers and officials from the UN peacekeeping mission in Congo, or MONUC, on this topic, each side is quick to blame the other. Congolese officers claim that MONUC is not doing enough to help them: “They intervene when they want, where they want and do what they want.” Conversely, MONIC blames the government: “Most of the Congolese army leadership simply ignores us when taking key decisions. They come to us only when they need us or when the situation is getting worse.” This suggests an urgent need to improve coordination and foster common understanding and responsibility for protecting the civilian population. Insecurity is on the rise in those territories controlled by the Congolese government and loosely affiliated militias in South Kivu. The Congo Advocacy Coalition has reported the stunning statistics: more than 1,000 civilians killed, 7,000 women and girls raped, 6,000 homes burned, and nearly 900,000 people forced to flee their homes during 2009 in North and South Kivu. But beyond such numbers a wider climate of terror and violence has infected daily life in South Kivu. A rash of incidents, including the kidnapping of Catholic priests in Walungu and the armed assault and looting of a hospital in Kabare, have been reported just during the first half of October, all attributed to ‘unidentified men in uniform.’ Reported incidents are just the tip of the iceberg, and perhaps most worrisomely, correspond with conditions conducive to soaring mortality rates. Such incidents provide only a sample of how insecurity has impacted daily life in South Kivu, as both provincial members of parliament and representatives of civil society spoke of numerous unreported cases of attacks on civilians by the Congolese army and other armed groups. 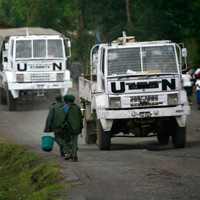 That all of the above incidents occurred in territory controlled by the Congolese army and affiliated militias suggests these groups are continuing to take advantage of the climate of impunity eastern Congo and that President Kabila’s “zero tolerance policy” for human rights violations is failing to deter abuses. Moreover, the relationship between provincial authorities and Congolese army officials appears problematic and poorly coordinated. Pay soldiers regular, adequate salaries and curbing corruption within the ranks, including senior officials complicit in the illegal mining and trade of minerals. Prevent Congolese soldiers from taking their dependents with them during military operations. This will begin to remedy some of the incentives for looting and predation. Promote accommodation between fragmented forces within the Congolese army and improve coordination between the armed forces and provincial political authorities. Accelerate stabilization by prioritizing the deployment of police and administrative structures in South Kivu.